In the case of lettuce I have to disagree, red and green salads look great growing on the allotment together and even better mixed together in a salad bowl. Soft buttery lettuce Bronze Arrow mixed with sharp crisp endive De Meaux. What’s better than picking some lettuce, taking it home giving it a good wash, a quick spin in the salad spinner and then mixing up a favourite salad dressing? My latest must make and try vinaigrette uses Chive Blossom Vinegar – I picked up the idea from Food In Jars and it couldn’t be brighter or simpler. Pick and snip the Chive flowers, wash them thoroughly, then pat them dry or if you have a salad spinner give them a whirl. 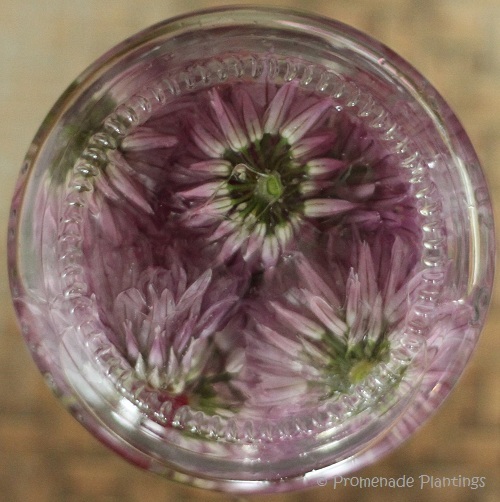 Fill a jar to about half way with the Chive flowers and then pour in the vinegar. Leave for a couple of weeks in a dark cupboard, then strain the flowers out, pop the Chive coloured and flavoured vinegar back in a jar and it’s ready to go. Simple and no faff. Mine will be ready next week, yip yip hooray! 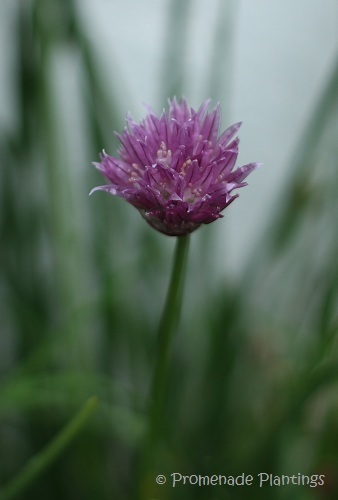 So from Salads and Vinaigrettes and onto Chive Vinegars, to where to grow chives ……. In an old fruit box of course. See, these chives are Europe Quality, whatever that means. What a fabulous idea! I can’t wait for my chives to flower. Could I re-blog this on my food page – if I can work out how to?! I so agree with you about the lettuces too. I love growing the colours mixed up but nothing this year has germinated yet! I think it must be the cold which is so unusual for Cornwall at this time of year. Things are usually racing away by now. It’s so simple an idea as well Tandy – a win win ! I wish we had beautiful wooden fruit boxes here…I would be talking the markets out of one for sure. I’m planning on making some chive vinegar as well this summer while in Maine. I think I’ll use rice vinegar for it. What a shame you don’t see the woodedn boxes, it’s funny what I presume to be univeral turns out not to be. I still have plenty of flower buds left on the chives, so I will try a batch with rice wine vinegar too, thanks for the suggestion Karen. What a nice idea! I’ll bet it’s a really pretty vinegar, too. I love a fresh mixed lettuce salad. Thank you! Yes, the vinegar turns a pretty shade of pink, what’s not to love ?! 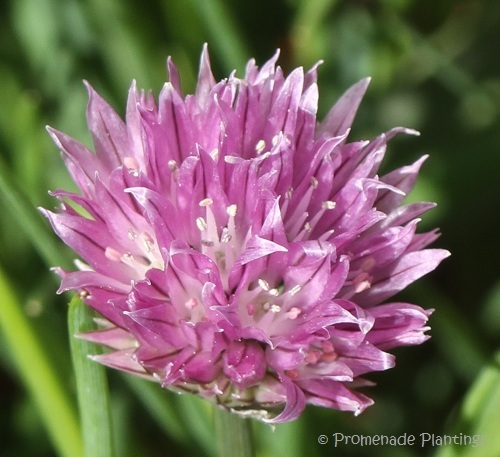 I’m doing chive vinegar, too…using up the blossoms means fewer volunteers to rip out this fall! I love that idea and I have a million chive plants–they are taking over my backyard, Thanks for the idea. Great idea, Claire, for infusing vinegar. I gave up my spice “pot” for another tomato plant last year and I really miss it. Maybe it’s time I re-think that decision, eh? Have a great weekend! I love vinegars–this is lovely. Chive Blossom Vinegar is one of my favorites! The fresh greens this time of year are lovely. What kind of vinegar did you use, Claire? This sounds good. 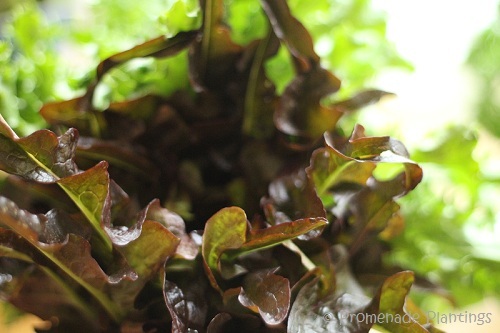 And red and green lettuces are perfect together. So, I still don’t know what you are using. Is it white vinegar, cider vinegar or red wine vinegar? Is it white in color, or brown, or red? The salad and the vinegar are both visual treats. There are so many recipes I need to try.. just because they’re so out of the realm of my every day cooking. I love this steeped vinegar idea.. and your boxes, Claire!! The boxes are nicer than the normal blue plastic ones I use, a little bit more appealing on the eye, it’s a shame they don’t last very long! Hi there choc chip, aren’t they lovely and before I found this recipe I just used to snip them and add them to the compost pile ! Hi Debra, I’m looking forward to trying it out – another week to go and it will be ready. I’m wondering what it would be like used on things like noodles or glass noodle salads with some corriander and mint. 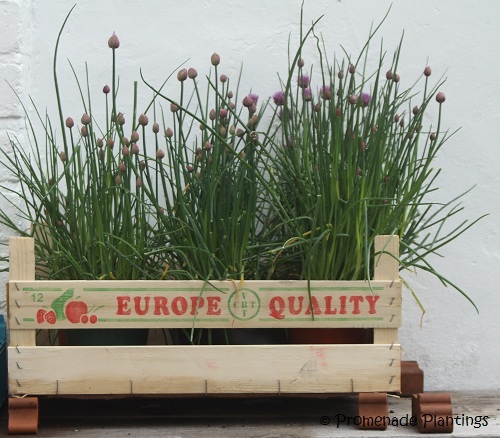 Beautiful chives and a great idea! We cut back our chives quite severely as they got a bit out of control. They´re back now but no flowers just yet. beautiful photos and yes, picking your own food, there is nothing better than that! sounds good and looks very good… I guess I never learned that red and greed don’t go together. meant green, of course… typing mistake. He, he – red and greed, I wonder….! I don’t know where the expression comes from Shimon, some say it’s nautical – green and red lights on boats. It’s just one of those rather odd sayings that I heard as a kid. oh that sounds and looks lovely. chives not in bloom yet here but they will be, they will be.